MONTREAL -- The country's transportation ministers have agreed to develop an entry-level national training standard for semi-truck drivers. "We are motivated by the need for safety," Garneau told reporters in Montreal. "Canadians expect that people who receive their licence as drivers of semi-trailers and large vehicles should be properly prepared through training before they assume those duties." 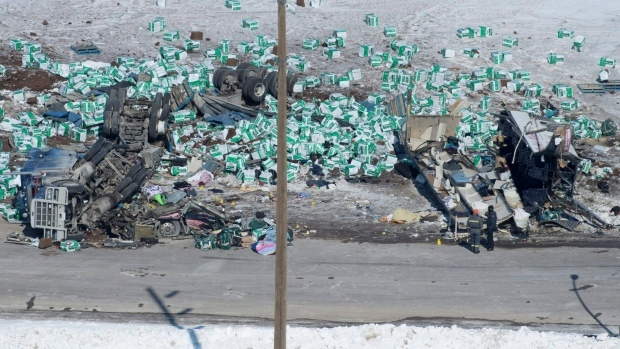 The changes in Saskatchewan came after last year's Humboldt Broncos bus crash tragedy, which Garneau referenced at a Montreal press conference following a transportation ministers meeting Monday. Sixteen people were killed when the team's bus and a semi-unit loaded with peat moss collided last April. The driver of the semi-truck recently pleaded guilty to all charges against him, telling his lawyer he did not "want to make things any worse." "We are truly one big country, and you go from province to province, so the same rules should apply," Carr said. "What happens if there is an emergency and everybody has to get out of the bus quickly?" Garneau asked. "We're looking for pilot projects and we're looking to do this as quickly as possible so that we evaluate the issue of seatbelts. At the same time, we're looking at other things."